Imagine you bought a horse, you are riding the meadows at a good speed, the horse asks for a break, you determine the ride is important and you ask him to postpone. The horse keeps riding for few minutes obeying your commands. Suddenly there is a jerk and you are thrown metres ahead of the horse and you look back and the horse is dancing in your face taking a break. THIS is the Windows 10 User Experience. With Windows 10 we saw that Microsoft learned a lot as they learn from every experiment (Windows Vista) and they If it ain’t broke, don’t fix it, Especially for the Windows XP Start Menu. User uses Software (in this case Windows) to accomplish some task/s. The software should facilitate the user accomplishing the task. The software should not come in the way of user performing the task. The software if needs maintenance should Ask the user for permission to perform maintenance and allow user to delay the maintenance. I woke up one fine day and i had some work to be done on my laptop. Meaning i / the user did the mistake. I wanted to work and get things done, i knew that updates get in the way of using the Tool (the software) to accomplish a task so i just hit “Close” and kept working, without giving much importance to the text. Few minutes later, i was busy noting down few million dollar details in notepad, suddenly the screen was to Restarting….. and i was mad. Though Windows XP, 7 and 8 oblige to apps that don’t allow a shut down, and give users a warning but this time Windows did not give a single warning. Not sure why the designers at Microsoft took this call of taking away this decision from the end user. Though this was very much available in Windows 7. You could control, which update you want to download and which one not to download at update level. Set them to auto or manual updates. Delaying the installation of updates. In Windows 7 system used to ask to restart now or Postpone, that means it did NOT want to come in the way of the user and allow him to use the tool as the user desired not as a designer forced. As with any bigger Windows Update, the restart actually took few hours and i was blocked from using MY TOOL, that I PAID FOR in MY WAY from accomplishing a task. So much for Usability. Allow me control on updates, will you? Another part of the depleted User Experience in Windows 10 is the Forced Updates. people strategize and prioritize what to allow and what not to allow. broadband plans come with an FUP. most plans are of the like High Speed upto a limit and then low speeds. e.g. 10 Mbps speed upto 10 Gb, later its 256 Kbps. Now imagine, its the mid of month and you have utilized 90 % of the bandwidth and don’t want to consume the bandwidth completely to avoid going down to slow speeds. 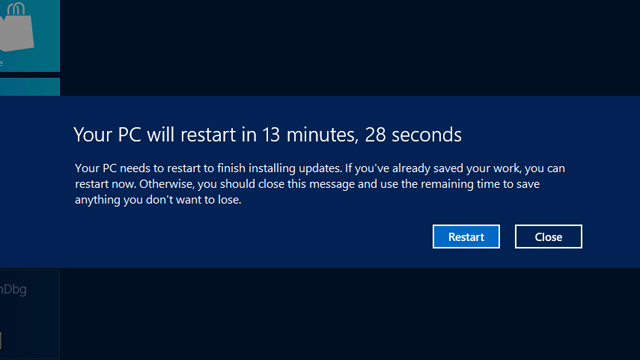 Ideally you would disallow windows from updating. Or simply say, you want to utilize the bandwidth for something else more important than Windows Update. Some people have plans which give high speeds at nights and you would want the update to download in the night while you dont need the system for any use and you dont have to watch over the system and the download can still get completed soon. And its not that people love these forced updates, just google around for block windows 10 update and you will find 100’s of blog posts with workarounds. Which validates there is a need. There would be some business needs where Microsoft wants all users to get the latest updates, with security updates of most importance. But why should this ever block the user from accomplishing his/her task ? Had i been a Designer at Microsoft i would have fought for retaining the user control and freedom, if the organization was ready to make a compromise on User Experience, the least i would do was give users a countdown timer with sufficient visual cue as to what is to happen so that for them to realize that they need to save their work as the system will go down.